Heeft u een vraag voor J8 Hotel? Voor reizigers die komen voor de bezienswaardigheden van Singapore, is J8 Hotel een perfecte keuze. Het levendige stadscentrum is slechts 3.4 Km verwijderd. Bezoekers van het hotel vermaken zich met de volgende topattracties die in deze stad te vinden zijn: Jalan Besar, Kampong Glam, Jalan Besar Stadium. Bij het J8 Hotel staan de excellente dienstverlening en superieure faciliteiten garant voor een onvergetelijk verblijf. Maak in het hotel gebruik van een selectie topklasse faciliteiten, zoals gratis wi-fi in alle kamers, dagelijkse schoonmaak, 24-uur receptie, bagageopslag, wi-fi in openbare ruimtes. De ambiance van het J8 Hotel weerspiegelt zich in de inrichting van de kamers. plasma tv, draadloos internet (gratis), rookvrije kamers, airconditioning, bureau zijn slechts enkele van de faciliteiten die u ter beschikking staan. Daarnaast garanderen de talrijke recreatieve mogelijkheden dat u zich tijdens uw verblijf kunt vermaken in het hotel. Ontdek een boeiende mix van professionele dienstverlening en een breed scala aan faciliteiten in het J8 Hotel. Dit hotel is zeker de moeite waard: vlakbij metro, Little India en Golden Mile Complex vanwaar je goedkoop (zeker bij bedrijf genaamd 707-Inc) bustickets kunt kopen voor o.a. Maleisië. Ontbijt: dagelijks een keuzemenu, naast de vaste elementen van Asian/Western items. 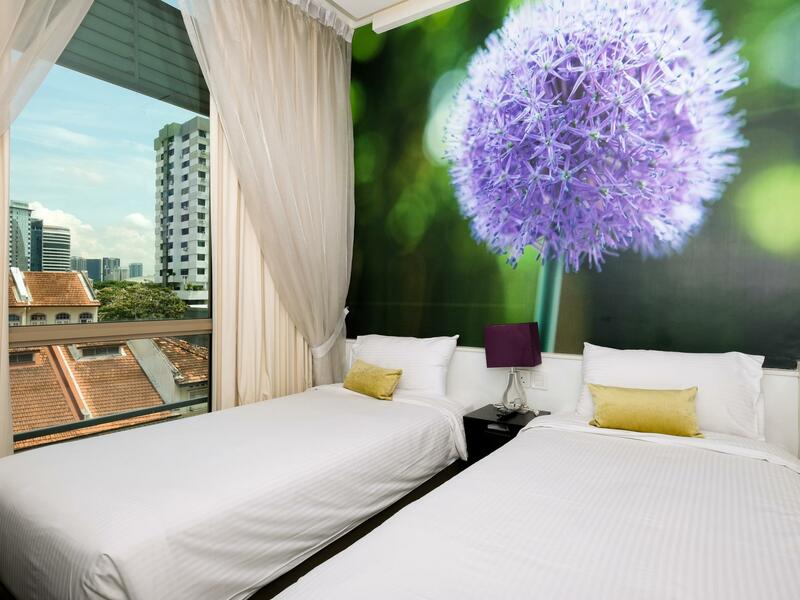 Good hotel near Little India and Kampong Glamm. Within a 10 minute walking distance from the MRT. Breakfast was nice. Room was small but you are more outside than inside. Lady when I checked in at the reception was not very helpful but the lady at check-out was really helpful and friendly. Erg prettig, de kamers zijn klein maar van alle gemakken voorzien. Erg schoon en je hebt absoluut geen last van anders reizigers omdat de kamers haast geluidsdicht zijn. Het metrostation Lavender is op vijf minuten loopafstand en daardoor is alles snel te bereiken. Prima hotel! In a quiet part of Little India. Nice staff, efficient check-in and -out and ok for just a short stay. However really economical rooms (not enough room to properly open suitcase), air con noisy and breakfast so so. Am a frequent visitor of this hotel, can recommend it to everybody. The breakfast is decent. The rooms are clean (although small, but that's nothing new in SG). 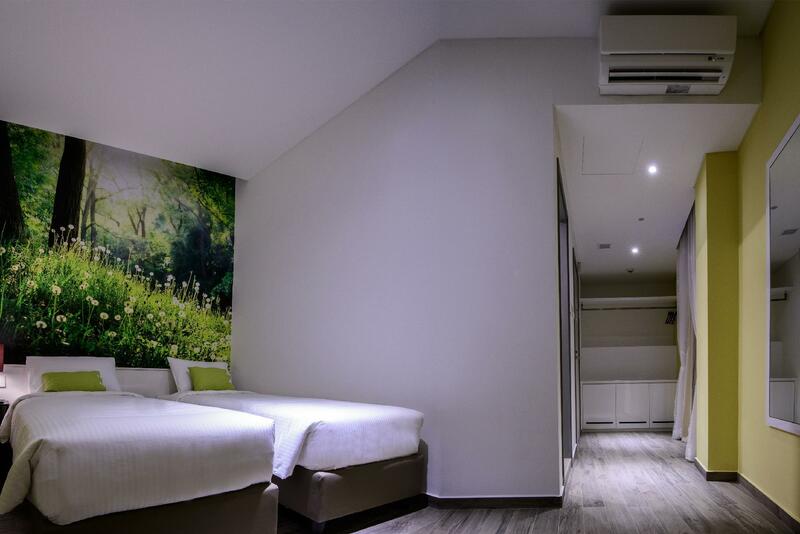 At walking distance from MRT Lavender (airport link), Jalan Besar and Farrer Park. Location is great, not really "the city area" that its not traffic and bustling with activities that you'll find in any busy metropolitan area, but near enought to the shopping area (MUSTAFA, City square and Bugis area). Just a few walks away from Lavender MRT(green line) , and Jalan Besar Mrt. (blue line) , and also Ferrer park Mrt (purple line). Room is realy Quite and neat. Breakfast is free . with free flow coffee and fresh juice. The waffles are nice! If yoiu find you want something else to eat, you can find good selection of restaurant nearby, from authentic SG foods ato fussion asian food. Location is really good and just a walk aways from mrt's and shopping area. Just a few bus stop away from bugis are and you can walk to City square and mustafa for endless shopping. there are a lot of foods to choose from from authentic to fusion foods. over all its great place to stay and very neat and quite. breakfast is really good as well. We were a family of 4 (2 adults and 2 young kids under 7) travelling in Singapore. The place is very clean, bright, and comfortable. Staff were friendly too. The place is rather tiny but may actually be a standard in Singapore? The breakfast is pretty good. I would say it's great value for the money. We would definitely stay here again. It's near enough to the train station and lots of food establishments within walking distance. We stayed 4 nights in the patio room.. Selected patio for the additional space as the room is quite congested. With a toddler the location is quite far away from nearest MRT / Bus stop. You have to walk at least 450m. Bed was comfy and walls are thick so no noises over night. Breakfast is set western menu with bread , porridge & noodles in the buffet section. Leave for the breakfast early as noodles tends to finish fast. Had trouble connecting to wifi, they had to reset server to resolve. TV has local channels, Netflix and YouTube. USB is not supported. They give 2 bottled water everyday as complimentary and first night mini bar was free with soft drinks & chocolates. There is a 7 11 store nearby. Staff at Ming Chung restaurant nearby was very friendly. I did see other hotel options which I was considering while booking that were closer to MRT/bus stops than j8. My toddler did enjoy time spend at the park opposite to the hotel. Good hotel with friendly staff. We had a patio room and the photo in Agoda was nothing like the room. There was barely enough room to walk past one side of the bed and the bed did not look out over the patio. Very small. Had 4 choices for breakfast with some variation each day. rooms are pretty tiny. Not sure if this is a singapore standard or not but for the price, I think it's still worth it. We got upgraded to the attic loft but you need to climb a flight of stairs which is a little inconvenient. Rooms are very clean and seems like it's just been renovated. Unit is very bright with modern styling. The bathroom is very nice but the one we got doesn't have a shower door by design and water splashes all over the the floor near the toilet. Staff is very friendly and welcoming. Breakfast was very good, they gave us 2 free breakfasts per day but they have a buffet type for coffee, orange juice, noodles, toasted bread and congee. Area is very convenient, lots of places to eat around walking distance. The room and toilet was a bit small but, me and my wife loves it coz it was very clean from the room to the toilet. Price was ok compared to other 3 star hotels in SG because breakfast was included. We will surely come back and stay again here. 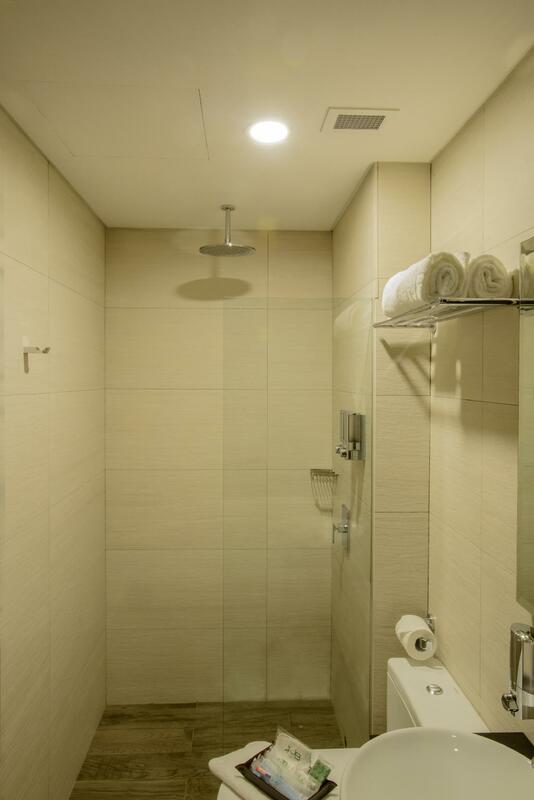 Very clean property, good locations and walking to a few MRT stations and shopping mall. Breakfast is pretty good. Rooms are very small but good just for sleep. Bed is comfortable, Tv is HD, shower gel is smooth. For a budget hotel, i find Its quite reasonable for the price. Location is good nearby restaurants & walk able to MRT stations (Jalan Besar &, Bugis, Lavender). Hotel also provide hourly extension until 6pm which is great for those having Midnight flight.